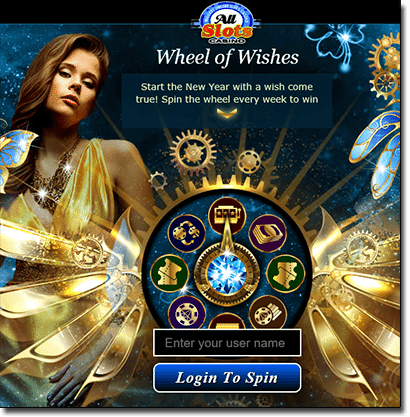 All Slots Casino is celebrating the start of the New Year by giving players the chance to spin the Wheel of Wishes every day of January to earn guaranteed prizes and kick start 2016 on a high note. The Wheel of Wishes is a Wheel-of-Fortune type bonus game where the player spins the wheel to see where it lands, granting all kinds of alluring prizes including free spins, free casino credits, cash back offers, matched deposit bonuses, extra loyalty points, loyalty multipliers and tickets to the Stardust Draw. The Stardust Draw is the big one, with winners drawn at random on January 31st to win up to a $1,000 bonus. There’s all kinds of ways to boost your bankroll here, so you can play real money blackjack for less risk to your own wallet, while also enjoying some of the other casino games available at All Slots. To get an extra spin each round, play for four days in a row during any of the above promotional periods and you’ll be eligible for a second spin that round. To take part in this great bonus offer head to AllSlots.com, head to the promotions section and click on the Wheel of Wishes banner. All you need to do to opt-in is enter your user name and login to spin. The countdown timer at the bottom of the promo login screen will tell you just how long you have to wait until you can come back for your next free spin. If you’re new to All Slots, sign up via our links and you’ll be rewarded with a generous welcome bonus of up to $1,600 in matched deposit bonuses spread out over your first four deposits. All Slots makes it easy for Aussies to play blackjack for real money, with many reliable payment options to choose from including Visa, MasterCard, POLi, Skrill, Entropay, Paysafecard and instant bank transfers. All Slots is one of our preferred AUD blackjack sites, with a solid range of 21 variants available, like Classic Blackjack, Vegas Strip Blackjack Gold, Atlantic City Blackjack Gold and Premiere Multi-Hand Blackjack Gold to name a few. Sign up at All Slots before the end of January to spin the Wheel of Wishes to make your buck go further and take this as a sign of good things to come for the 2016 year ahead.